Image Video Maker converts images to video and extracts images from video & Flash. This software supports all popular video and image formats. Image Video Maker empowers you to get more personal videos from digital photos. You can also add audio into converted video. 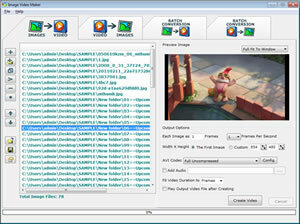 Image Video Maker can extract image sequence or summary stills from video with cutting-video feature. All functions can run in batch method.